Four JROTC Scholarship awards totaling $6,500 were presented this year during the Chapter luncheon at McCormick Ranch Golf Course on Saturday, the 25th of May 2013. All four scholarship recipients indicated they intend to serve in the military after their advanced schooling. Cadet Vu Nguyen plans on joining the Air Force ROTC program at Arizona State University (ASU) where he will major in computer science. Cadet Luis Garcia also plans on joining the Air Force ROTC program at ASU where he will major in aerospace engineering. Cadet Alexis Farnsworth has accepted an appointment to the United States Merchant Marine Academy and intends on pursuing a career in the Navy upon graduation. Cadet Shelby Gallagher has accepted an appointment to the United States Air Force Academy. 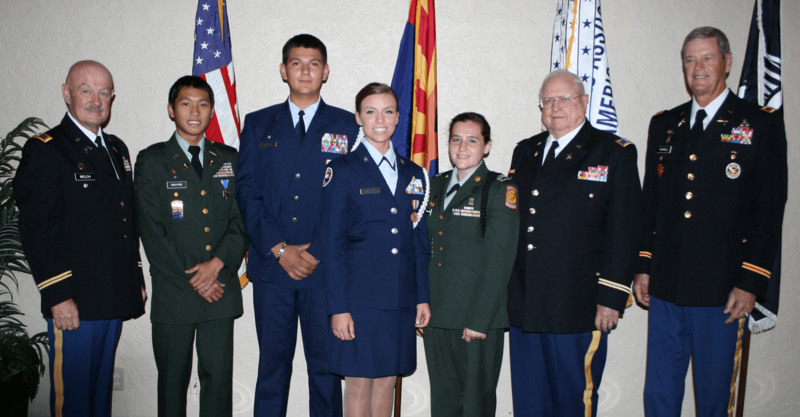 2013 Scholarship Awardees, left to right: Chapter President Colonel Rob Welch, Central HS Cadet Vu Nguyen, Sandra Day O’Connor HS Cadets Luis Garcia & Alexis Farnsworth, North HS Cadet Shelby Gallagher, Scholarship Treasurer Colonel Bill Roscher, and Scholarship Committee member Colonel Rance Farrell.